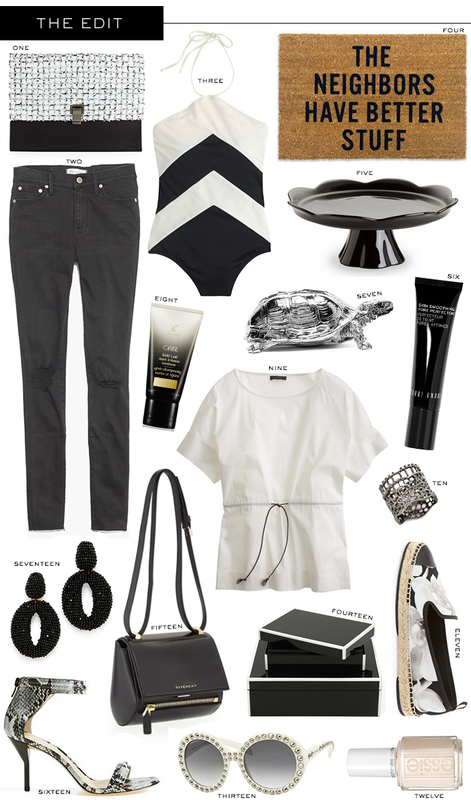 This week’s EDIT features one of my favorite all-time combos: black and white! I recently picked up this pair of sandals and can’t wait to pull them out when the temps come back up in Dallas. Because I’ve been in NYC the past several days, I haven’t had enough time to dedicate to today’s regular bullets of sales and steals. I apologize for being flaky today – it’s just been too crazy! I hope you enjoy these black and white classics as much as I do. I’ll be back tomorrow with a brand new outfit post – stay tuned and have a great Tuesday! #15 is so good and love your new sandals. Great picks, I really enjoyed this post. I need this black cake platter! I am going to need that door mat! Too funny! Dying over that black and white one-piece!! Nothing could be as classic as black and white, loving this roundup! Great picks! I’m obsessed with the door mat. Loving the boxes, earrings, and shades. That doormat though, I need that in my life ASAP! Loved this roundup! Such a chic color combo! The clutch has to be my favorite! Enjoy your time in New York! You always have the best edits! I am ordering that doormat, my husband will love it! That turtle is a cutie! Love the one piece! Sadly the link isn’t working for me (links to a different dress) – could you direct us where to purchase it?